Rocketpunk Manifesto: Everything Old is New Again? No dull wedge shapes or anvil aerodynamics here! With those wingtip jet engines and little canard wing forward, the Skylon seems to hurtle into the future straight from 1959. (Compare to the winged shuttle in my banner illo at top.) In a concession to modernity the Skylon is an unpiloted cargo vehicle. It is also enormous, much larger than it appears, due to the vast bulk of liquid hydrogen. But this is how were supposed to cross the edge of space. Probably nothing will come of it, and we will keep getting into space the old fashioned way. But there is a reputed saying in aviation, 'looks good, flies good.' If the design cycle starts turning out exciting looking spacecraft, one of them might actually get built. Meanwhile, what a wonderful daydream! Alas. SSTOs are inherently extreme. As inconvenient as two stages to orbit is, that is probably the only way you get vehicles robust enough for service. "Alas. SSTOs are inherently extreme." At least if you are limited to using chemical rockets. If that nuclear lightbulb technology was actually demonstrated, I would be inclined to use it in a somewhat different design of shuttle. 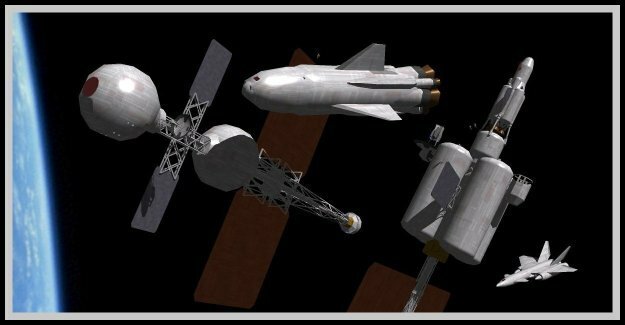 Use one or two such engines in a winged spaceplane, & in each mission leave all the radioactive material in orbit for later transfer to a storage site in high orbit (eg: earth-moon L5 point). This way a crash on return wouldn't make the crash site radioactive. The left over uranium would be used for powering interplanetary nuclear space ships. I seem to remember there was once proposed a 'cheat' to SSTO; a small rocket engine in the tail of a 'conventional' multi-mode jet engine powered craft, that would ignite near the last bit to orbit. Kind of a 'SSTO and a half'. I think the reason given was it simplified the overall design, even though it still had two sets of engines. Maybe not taking a huge step, but merely a large one, might lead to improved designs for a true SSTO later, but still decreasing launch costs and increasing access to space in the meantime. Just some off the cuff thoughts. Nuke thermal was good enough in Heinlein stories, but nuclear anything for orbit lift is a political nonstarter, and I'm doubtful it would really have the power density needed for orbit lift. But launch cost is not primarily technical - even with expendables, something like 70 percent of cost is the ground operation. Vandenberg AFB, not too far from where I live, probably costs about as much to operate as a major airport, and has about one launch per month. Basically it is the low traffic volume that makes launch cost so high. Isn't it brilliant that someone can write about "getting into space the old fashioned way", when I read things like that it brings out the optimist in me. I've sort of gone full orbit from optimism to pessimism and back. Compared to what I expected as a kid (more or less Kubrick's 2001), reality has seemed like a drag, but it sneaked up on me that we've actually had a permanent space station for eight and a half years now. In case you've missed this Skylon has just passed an ESA/UKSA deisgn review and is well on its way to engine prototyping and large scale private financing. It really seems like it might just happen. Oh, and I love this blog.